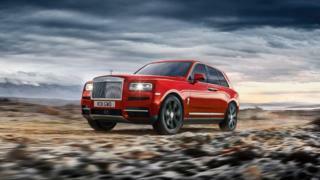 Rolls-Royce has become the latest luxury car maker to launch an SUV. Chief executive Torsten Müller-Ötvös said the new Cullinan, which will cost more than £200,000, was a "seminal" moment and probably the "most anticipated" Rolls-Royce ever. Bentley and Lamborghini have already launched SUVs, while Ferrari will follow next year. Automotive analysts said Rolls, which is owned by BMW, had to follow suit to keep up with changing consumer demand. The launch of the Cullinan, named after the world's biggest diamond that is part of the Crown Jewels, marks a shift away from the luxury saloon cars that Rolls-Royce is best known for. Mr Torsten Müller-Ötvös told the BBC its target group had changed significantly over the past decade. "What we see is ultra-high net worth individuals - people who can afford a Rolls-Royce - are getting younger and younger," he said. "You see people who want to drive themselves, It's quite an old cliche that Rolls-Royce is chauffeur-only." The new clientele want a car that "fits to go to the opera, which brings you up to the chalet in the Swiss Alps and so on", he added. Motor industry analyst Arndt Ellinghorst of Evercore ISI said SUVs had already replaced the majority of top-end limousines because they offered a more comfortable seating position and better road view. "If you drive an 'ordinary luxury car' you look like a chauffeur; in a luxury SUV you're still the king". He said there was "no reason" why Rolls-Royce should not enter this very profitable segment of the market. "Tradition is one thing but Rolls-Royce also needs to address contemporary changes in demand. The brand has a great opportunity to move from 3,000-4,000 units a year to 5,000-6,000 without sacrificing its extreme luxury appeal," Mr Ellinghorst added. "They will most certainly succeed. BMW has the technology that Roll-Royce can leverage into a benchmark super luxury SUV." It may not be pretty, but Rolls Royce is hoping the new Cullinan will catch the eye of buyers in its most important markets. In China in particular, sales of sports utility vehicles are soaring - and the company wants a piece of the action. It might seem like a strange road for Rolls to go down. It is best known for its more traditional luxury saloons, after all. But its rivals are doing the same kind of thing. Bentley already has its gargantuan Bentayga SUV on the market; there's also the Lamborghini Urus. Aston Martin is working on one, as is Ferrari. All of them have realised that what many super-rich people want to buy is neither a sportscar nor a luxury sedan. They want an SUV. So the Cullinan may not exactly exude old world charm, but it could well prove popular among a brash new breed of customers.